J. P. Babcock, A. R. Hager, A. N. Lethin and the Mah-Jongg/Mah-Jong Company of China et al. The story of the related companies of the Mah-Jongg/Mah-Jong Company of China, Shanghai, the Mah-Jongg Sales Company of San Francisco, the Mah-Jongg Sales Company of America, San Francisco and the Continental Mah-Jongg Sales Company, Amsterdam, involves seven people—Albert R. Hager and Emily Hager; Joseph P. Babcock and Norma Babcock; Anton N. Lethin and Helen Van Housen-Lethin and W. A. Hammond. It was their travels and occupations in one way or another that fortuitously brought them together and eventually led, via the aforementioned Companies, to a version of a popular Chinese game exploding onto the Western social scene – particularly the United States – in the early 1920s. The popular Chinese game was called in the local Shanghainese pronunciation 麻雀 mo ziang and in Mandarin as má jiàng which eventually was written as 麻將. In the West, the variant of the game of interest here was called Mah Jongg. Various sources have been used to piece together the dates and locations of the events that eventually brought about the introduction of Mah Jongg to popular attention in the West. First, in relation to the Babcock’s, are passport applications, consular applications and certificates, marriage certificates, ship passenger lists and census records. In addition is a 1923 description by Joseph Park Babcock of his encounter of the game in China and how he came to develop for Western players the tile set, the game-play and the name for his version of the Chinese game. Second, is a 1924 testimony by Norma Babcock, relating her perspective of events that led her husband to China and to their encounters of the various Chinese versions of the game and how the game of Mah Jongg was introduced to the United States. Third, is the testimony contained in a letter, dated Shanghai, February 18, 1923, that Anton Lethin wrote to his elder sister. This testimony describes the chance meeting the Lethins had with the Babcocks in the United States and the Lethins’ chance experience of the game in China. It also describes the formation of the Mah-Jongg Company of China and the movements of Albert Hager. The letter also provides a description of the tile set manufacturing process. In addition to his testimony we have that of his granddaughter (Lisa Lethin), which also provides valuable additional evidence. The fourth line of evidence is drawn from various biographical dictionary sources collated by my colleague Thierry Depaulis of the International Playing Card Society. These relate to Albert Hager and Anton Lethin and give a detailed account of their time in the Philippines and China. Fifth, are patent and trademark applications filed by Joseph Babcock and Albert Hager, that contain information about dates, companies and games’ apparatus. Finally, are two useful resources. The first is ‘Foster on Mah Jong Mah Cheuk Ma Chang Pung Chow’ by R. F. Foster, 1924. However, information from this book must be used with caution, for there are no references of primary sources. The second is the paper ‘The Game of One Hundred Intelligences”: Mahjong, Materials, and the ‘Marketing of the Asian Exotic in the 1920s’ by Mary C. Greenfield. Although the character portrait painted of Babcock in the paper is at odds with what we know of Babcock from the relevant evidence, this paper does contain useful evidence-based data derived from sources referenced in the footnotes. In order to determine if the information taken from second and third hand accounts or testimonies is reliable, comparisons were made with the first hand sources listed above to check for consistency. Conclusions drawn from these comparisons are flagged by caveats to show that they are considered tentative statements and should be treated as such. All sources are referenced as Footnotes at the end of the relevant sections. Passport Application dates are taken from the date of the Oath of Allegiance on each application. Where these are not available, the Application order is taken from the Application number stamped at the top right of each Application page. Albert Ralph Hager (1874-1952) achieved a Bachelor of Science degree in 1897. On December 21, 1904 he married Emily Read, a teacher of Salt Lake City. In 1901 he was part of a group of teachers sent by the United States government to the Philippines on the USS Thomas. These teachers –called Thomasites – set up a new public school system and used English as a means of instruction for training Filipino teachers. From 1901-1903 Hager was an instructor in Physics at the Philippine Normal School in Manila, a post he occupied until he became Chief of the Education Department (based at the Philippine Exposition Building in Manila) of the Philippine Exposition at the St Louis Exposition from 1903-19041. He was a member of the Clarke & Co., Technical Supply Company of China, Japan and the Philippines, with residences in Manila and Shanghai from 1905 – 1906 1, 2, and then he became General Agent for the Manila-based Asian branch of the International Correspondence Schools for China(Shanghai), Japan(Tokyo), Korea and the Philippines(Manila) from 1907 until at least 1925. This required him to travel between, and reside in, Manila, Shanghai and Tokyo 3, 4. In 1921 he started the Business Equipment Corporation, Shanghai, and then in early 1922 he became co-partner in the Mah-Jongg Company of China. According to Anton Lethin in a letter to his sister Agnes dated Shanghai, February 18, 19235. We organised the Mah-Jongg company about a year ago forming a partnership consisting of Mr Hager, Joe Babcock, the chap that wrote the “Little Red Book of Rules” and myself [thus “about a year ago” from February 8, 1923, would place the company’s formation around late January-early February 1922]. Who Was Who in America, 1974. Published by Marquis Who’s Who in 14 chronological volumes. Wisconsin Alumni Magazine, Loeb, Max (ed.) Volume 7, October 1905 – July 1906. Published at Madison by the Wisconsin Alumni Association as the Wisconsin Alumni Magazine from 1899 to 1935 (volumes 1-37). The Phi Gamma Delta, Volume 34, 1911-1912. P.644. The Educational Directory and Yearbook of China, 1918. P46. Taipei : Ch’eng Wen Publishing Company, 1973. Anton N. Lethin. Letter to his sister, Agnes, Shanghai, February 18, 1923. Joseph Park Babcock (1893-1949) was born in Lafayette, Indiana. In 1912 he graduated from Purdue University with a Bachelor of Science degree in Civil Engineering and resided in Lafayette with an occupation as a clerk6. He entered the Standard Oil class for foreign service7 and on July 16, 1913 he left the United States for China8. Analyses of two of Joseph Babcock’s sea bound trips between the USA and China (USA to Shanghai (27 days)9 and Shanghai to San Francisco (25 days)10) reveals he very likely arrived in Shanghai, some time in mid August 1913, where he stayed for five months – that is, until at least the end of December 191311. After his 5 month stay in Shanghai he arrived in Tientsin [Tianjin], Shandong Province in North China, on January 6, 1914 and was listed as “temporarily sojourning” and “residing for the purpose of business” on behalf of the Standard Oil Company, Tianjin12,13. Since he was given the post as Manager of the Standard Oil Company’s Peking [Beijing] office14 within 6 months of his arrival in China and given he most probably arrived in China sometime in mid August 1913, then within six months from that date would mean he was given the post some time before February 1914. This may account for his temporary presence in Tientsin [Tianjin] – as an intermediate stop-over for Peking. Just under six months later, on June 25, 1914, he arrived in Peking [Beijing] where he took up residence until 191615 for the purpose of trade (as a two-year posting as Manager of the Peking Office of the Standard Oil Company of New York)16. In or before October 1916 he left Hong Kong with Norma Nethol Noble (who he had met sometime after her arrival in China in November 1915) aboard the RMS Empress of Asia bound for Yokohama, Japan17. They arrived in Kobe where they were married, on October 5, 191618. Rejoining the RMS Empress of Asia they set sail for Victoria, Canada, arriving on October 22, 191619. They subsequently made their way to the United States for the purpose of the introduction of Norma Babcock to Joseph Babcock’s parents in Lafayette, Indiana20. On January 17, 191721,22 they set sail on the Siberia Maru23 for Shanghai, China, arriving on February 13, 191724 and immediately travelled to Harbin, Heilongjiang province in North East China, arriving there 6 days later on February 19, 1917. They resided in Harbin until probably September of that year for the purpose of Joseph Babcock’s occupation as Manager on behalf of the Standard Oil Company of New York, based at 18 Diagonalnaya, Harbin25. After Harbin they travelled to Soochow [Suzhou], Jiangsu province, Central China, arriving in September 1917 and where they resided for two years and seven months in Soochow [Suzhou] for the purpose of Joseph Babcock’s position of Salesman on behalf of the Standard Oil Company26. On March 28, 1920 the Babcocks departed Shanghai and set sail aboard the S.S. Equador for San Francisco where they arrived on April 22, 192027 taking up residence on the island of Catalina28. On July 29, 1920 the Babcocks departed San Francisco and arrived at Tsinan [Jinan], Shandong province in North China on August 19, 1920,29,30 where Joseph Babcock was the Business Representative on behalf of the Standard Oil Company of New York31. They resided in Tsinan [Jinan] for three years after which time they travelled to Shanghai, and on the September 19, 1923 set sail aboard the S.S. President Lincoln, arriving at San Francisco on October 9, 192332 where Joseph Babcock gave his occupation as “marketer”33. During their time in the United States Norma Babcock visited the island of Catalina on Sunday, April 13, 192434 and gave an interview for the island newspaper, The Catalina Islander. Nine months later Joseph and Norma Babcock were booked for a return trip to China from Seattle aboard the S.S. President Grant July 31, 192435. Figure 1. Joseph and Norma Babcock’s journeys in, to and from China and the USA and Canada (See list below). Peking[Beijing] 1916 to Hong Kong 1916. Hong Kong 1916 to Yokohama(Japan). 1916. Yokohama 1916 to Kobe(Japan) Oct. 5, 1916. Kobe 1916 to Yokohama(Japan) 1916. Yokohama 1916 to Victoria (Canada) Oct. 22, 1916. Lafayette 1917? to San Francisco. 1917. San Francisco Jan. 17, 1917 to Shanghai Feb. 13, 1917. Suzhou March? 1920 to San Francisco Apr. 22, 1920. San Francisco July 29, 1920 to Jinan August 19, 1920(~2 yrs 11 months residence). Jinan 1923 to Shanghai 1923. Shanghai Sept. 19, 1923 to San Francisco Oct. 9, 1923. Seattle July 31, 1924 to China. Passport Application February 7,1914. National Archives and Records Administration (NARA); Washington D.C.; NARA Series: Passport Applications, January 2, 1906 – March 31, 1925; Roll #: 202; Volume #: Roll 0202 – Certificates: 21452-22300, 22 Jan 1914-11 Feb 1914. Department Passport Application April 22, 1918. National Archives and Records Administration (NARA); Washington D.C.; NARA Series: Passport Applications, January 2, 1906 – March 31, 1925; Roll #: 757; Volume #: Roll 0757 – Certificates: 77750-77999, 26 Apr 1919-28 Apr 1919. See footnote 7. Both departure and arrival dates are given in this application. S.S. Equador Passenger List, Shanghai – San Francisco. Ancestry.com. California, Passenger and Crew Lists, 1882-1959 [database on-line]. Provo, UT, USA: Ancestry.com Operations Inc, 2008. Original data: Selected Passenger and Crew Lists and Manifests. National Archives, Washington, D.C. Application for Registration – Native Citizen. March 2, 1917. Roll #: 32734_1220706418_0257. Original data: Department of State, Division of Passport Control Consular Registration Applications. U.S., Consular Registration Applications, 1916-1925. Passport Application, January 12, 1914. National Archives and Records Administration (NARA); Washington D.C.; NARA Series: Passport Applications, January 2, 1906 – March 31, 1925; Roll #: 202; Volume #: Roll 0202 – Certificates: 21452-22300, 22 Jan 1914-11 Feb 1914. Source Information Ancestry.com. U.S. Passport Applications, 1795-1925 [database on-line]. Provo, UT, USA: Ancestry.com Operations, Inc., 2007. Certificate of Registration of American Citizen, February 17, 1914. Consular Registration Certificates, compiled 1907–1918. ARC ID: 1244186. General Records of the Department of State, 1763–2002, Record Group 59. National Archives at Washington, D.C. Ancestry.com. U.S., Consular Registration Certificates, 1907 – 1918 [database on-line]. Provo, UT, USA: Ancestry.com Operations, Inc., 2013. Certificate of Reregistration of American Citizen. Ancestry.com. U.S., Consular Registration Certificates, 1907 – 1918 [database on-line]. Provo, UT, USA: Ancestry.com Operations, Inc., 2013. Original data: Consular Registration Certificates, compiled 1907–1918. ARC ID: 1244186. General Records of the Department of State, 1763–2002, Record Group 59. National Archives at Washington, D.C.
(a) R.M.S Empress of Asia, passenger List. Hong Kong – Yokohama. Ancestry.com. Canadian Passenger Lists, 1865-1935 [database on-line]. Provo, UT, USA: Ancestry.com Operations Inc, 2010. Original data: Passenger Lists, 1865–1935. Microfilm Publications T-479 to T-520, T-4689 to T-4874, T-14700 to T-14939, C-4511 to C-4542. Library and Archives Canada, n.d. RG 76-C. Department of Employment and Immigration fonds. Library and Archives Canada Ottawa, Ontario, Canada. (b) Passport Application. Form for Native Citizen. United States of America. July 10, 1924. National Archives and Records Administration (NARA); Washington D.C.; NARA Series: Passport Applications, January 2, 1906 – March 31, 1925; Roll #: 2601; Volume #: Roll 2601 – Certificates: 457850-458349, 14 Jul 1924-14 Jul 1924. Source Information: Ancestry.com. U.S. Passport Applications, 1795-1925 [database on-line]. Provo, UT, USA: Ancestry.com Operations, Inc., 2007. Original data: Selected Passports. National Archives, Washington, D.C. Marriage Certificate. National Archives and Records Administration (NARA); Washington, D.C.; Marriage Reports in State Department Decimal Files, 1910-1949; Record Group: 59, General Records of the Department of State, 1763 – 2002; Series ARC ID: 2555709; Series MLR Number: A1, Entry 3001; Series Box Number: 475; File Number: 133/476. Source Information: Ancestry.com. U.S., Consular Reports of Marriages, 1910-1949 [database on-line]. Provo, UT, USA: Ancestry.com Operations, Inc.
R.M.S. Empress of Asia passenger List, Yokohama – Victoria B.C. Ancestry.com. Canadian Passenger Lists, 1865-1935 [database on-line]. Provo, UT, USA: Ancestry.com Operations Inc, 2010. Original data: Passenger Lists, 1865–1935. Microfilm Publications T-479 to T-520, T-4689 to T-4874, T-14700 to T-14939, C-4511 to C-4542. Library and Archives Canada, n.d. RG 76-C. Department of Employment and Immigration fonds. Library and Archives Canada Ottawa, Ontario, Canada. (a) Department Passport Application – Native. March 2, 1917. National Archives and Records Administration (NARA); Washington D.C.; NARA Series: Passport Applications for Travel to China, 1906-1925; Box #: 4433; Volume #: Volume 20: Emergency Passport Applications: China. Source Information: Ancestry.com. U.S. Passport Applications, 1795-1925 [database on-line]. Provo, UT, USA: Ancestry.com Operations, Inc., 2007. (b) Department Passport Application – Native. March 6, 1917. National Archives and Records Administration (NARA); Washington D.C.; NARA Series: Passport Applications for Travel to China, 1906-1925; Box #: 4433; Volume #: Volume 20: Emergency Passport Applications: China. Source Information: Ancestry.com. U.S. Passport Applications, 1795-1925 [database on-line]. Provo, UT, USA: Ancestry.com Operations, Inc., 2007. Original data: Selected Passports. National Archives, Washington, D.C.
Department Passport Application – Native. April 22, 1918. National Archives and Records Administration (NARA); Washington D.C.; NARA Series: Passport Applications, January 2, 1906 – March 31, 1925; Roll #: 757; Volume #: Roll 0757 – Certificates: 77750-77999, 26 Apr 1919-28 Apr 1919. Source Information: Ancestry.com. U.S. Passport Applications, 1795-1925 [database on-line]. Provo, UT, USA: Ancestry.com Operations, Inc., 2007. [Note] This application gives an incorrect departure date from San Francisco. It should be January 17, 1917. Application for Registration – Native Citizen. February 24, 1919. Roll #: 32734_620305173_0270. Source Information:Ancestry.com. U.S., Consular Registration Applications, 1916-1925 [database on-line]. Provo, UT, USA: Ancestry.com Operations, Inc., 2012. Original data: Department of State, Division of Passport Control Consular Registration Applications. S.S. Equador Passenger list. Ancestry.com. California, Passenger and Crew Lists, 1882-1959 [database on-line]. Provo, UT, USA: Ancestry.com Operations Inc, 2008. Original data: Selected Passenger and Crew Lists and Manifests. National Archives, Washington, D.C. Application for Registration – Native Citizen. September 18, 1920. Roll #: 32734_620303987_0274. Source Information:Ancestry.com. U.S., Consular Registration Applications, 1916-1925 [database on-line]. Provo, UT, USA: Ancestry.com Operations, Inc., 2012. Original data: Department of State, Division of Passport Control Consular Registration Applications. Department Passport Application – Native. September 23, 1921. National Archives and Records Administration (NARA); Washington D.C.; NARA Series: Passport Applications, January 2, 1906 – March 31, 1925; Roll #: 1770; Volume #: Roll 1770 – Certificates: 95250-95625, 03 Nov 1921-04 Nov 1921. Source Information: Ancestry.com. U.S. Passport Applications, 1795-1925 [database on-line]. Provo, UT, USA: Ancestry.com Operations, Inc., 2007. Original data: Selected Passports. National Archives, Washington, D.C.
(a) S.S. President Lincoln, Passenger List Ancestry.com. California, Passenger and Crew Lists, 1882-1959 [database on-line]. Provo, UT, USA: Ancestry.com Operations Inc, 2008. Original data: Selected Passenger and Crew Lists and Manifests. National Archives, Washington, D.C.
(b) The ‘SS President Lincoln’ used by Babcock to traverse the Pacific, was originally called the ‘Hoosier State’. The ‘Hoosier State’ was originally built for the United States Shipping Board in 1922 and had its name changed in that year to ‘SS President Lincoln’. It belonged to a fleet of ships managed by the Pacific Mail SS Company that was a subsidiary of the Grace Line, until 1925 when the PMSS Co., was purchased by the Dollar Line. Joseph P. Babcock. Form for Native Citizen. United States of America. July 10, 1924. National Archives and Records Administration (NARA); Washington D.C.; NARA Series: Passport Applications, January 2, 1906 – March 31, 1925; Roll #: 2601; Volume #: Roll 2601 – Certificates: 457850-458349, 14 Jul 1924-14 Jul 1924. Source Information: Ancestry.com. U.S. Passport Applications, 1795-1925 [database on-line]. Provo, UT, USA: Ancestry.com Operations, Inc., 2007. Original data: Selected Passports. National Archives, Washington, D.C.
(b) Norma N. Babcock. Passport Application. Form for Native Citizen. United States of America. July 10, 1924. National Archives and Records Administration (NARA); Washington D.C.; NARA Series: Passport Applications, January 2, 1906 – March 31, 1925; Roll #: 2601; Volume #: Roll 2601 – Certificates: 457850-458349, 14 Jul 1924-14 Jul 1924. Source Information:Ancestry.com. U.S. Passport Applications, 1795-1925 [database on-line]. Provo, UT, USA: Ancestry.com Operations, Inc., 2007. Original data: Selected Passports. National Archives, Washington, D.C.
Anton Nathaniel Lethin (Pronounced Leh-THEEN) (1887-1966) arrived in China July 191536 and joined the Shanghai branch of the International Correspondence Schools37 headed by Albert R. Hager who was the General Manager/Agent for the International Correspondence Schools based in China, Japan, Korea and the Phillipines38. He volunteered to serve in China during the first World War, joining the Voluntary Civil Service from 1915-1919. His residential address was at 680 Avenue Joffre and his office address was 73 Szechuen Road, Shanghai, (the office address of A. R. Hager and therefore of the Shanghai branch of the International Correspondence Schools)39. In November 1916 he returned to the United States to marry Helen Van Housen whom he had met during a previous visit. They departed San Francisco on January 17, 191740 setting sail for Shanghai on the Siberia Maru41 for Shanghai, China, arriving on February 13, 191742. By 1920 he was manager of the China Agency of the International Correspondence Schools in Shanghai, where he and his wife were residing since returning from the United States three years earlier. Their United States address was given as 202 Wellington Avenue, Elgin, Illinois43,44. While Albert Hager was visiting the United States on business, ~ 22 September 1922 – 21 February 1923, Lethin managed the Business Equipment Corporation, the International Correspondence School (Shanghai) and was the permanent manager of the Mah-Jongg Company of China45. Lunt. C. The China Who’s Who 1925 (foreign): a biographical dictionary. Shanghai, 1925. The Educational Directory and Yearbook of China, Shanghai, 1920, P.52. See Footnotes 21 & 22. The Educational Directory and Yearbook of China, Shanghai, 1920, P.83. 3. Má Jiàng (Sparrows) Becomes Mah-Jongg (Sparrows). 3.1 The Babcocks, the Lethins and Hagers. The story of how the Chinese game of mo ziang/má jiàng (Sparrows) became a popular Westernised version called Mah-Jongg – initially via the Mah-Jongg Company of China – really begins with the experiences of Joseph Park Babcock in Shanghai, then Tianjin and Peking. After a year and a half in Peking he met and eventually married Norma Noble who had arrived in China in November 1915. Following their subsequent trip to the United States they returned to China, residing in Harbin, then Suzhou and Jinan. It was from these centres that they encountered different variations of the game. He and his wife Norma Babcock also revisited these cities in the course of their travels and used their residences as centers for their travels into the interior of China. There are two sources of original testimony by the Babcocks. The first is a letter by Joseph Babcock accompanying an advertisement in the The Saturday Evening Post, December 15, 1923. The second is an article by Norma Babcock in The Catalina Islander newspaper April 16, 1924. The accounts given in these two testimonies are supported by the biographical and geographical information taken from the sources listed in the references above as well as original testimony given by Anton Lethin in his important 1923 letter to his elder sister, Agnes. If Babcock was speaking Mandarin then that would have enabled him to communicate with Chinese officials when performing his job. However, this may have posed some problem in the South East of China where Mandarin was less widely spoken. From Shanghai he was able to visit Suzhou and Nanjing to the West and Ningbo and Hangzhou to the South. Jinan to the South East and other cities in North Western China would have been accessible to him from Tianjin. This would have been particularly significant after he took up his first important residence in Peking [Beijing], where he arrived June 25, 1914 – after the five months spent in Shanghai and just under six months spent in Tianjin. From Peking he would have had a more economical striking point to the interior of North China and hence to the north China variants of má jiàng, where they existed. On January 17th 1917 the two couples sailed to Shanghai aboard the Siberia Maru. Figure 2. Helen van Housen-Lethin(left) and Norma Babcock(right) aboard the Siberia Maru. San Francisco – Shanghai, 1917. (Courtesy of Lisa Lethin and Jelte Rep at; http://www.mahjongmuseum.nl/mijn-groot-vader-was-de-zakenpartner-van-joe-babcock/). Upon their arrival on February 13, 1917, the Lethins took up residence in Shanghai for Anton Lethin’s post in the International Correspondence Schools’ Shanghai division headed by Albert R. Hager. The Babcocks on the other hand, immediately travelled North to Harbin, Manchuria, where they arrived six days later on February 19, 1917. Joseph and Norma Babcock spent approximately seven months residing in Harbin, with opportunities to travel to the far North West and North East of China and also into Korea. Now that they were stationed in Suzhou, the Babcocks must have re-established their friendship with Anton and Helen Lethin who were living in Shanghai. Their friendship with the Lethin’s would also allow them to become acquainted with Albert Hager and his wife Emily Hager through the Lethins’ friendship with the Hagers, as evidenced from pictures of the Lethins visiting the Hagers socially(see Figures 3 and 4 below). Figure 3. Emily Hager and her son with Anton Lethin, 1917. Courtesy of Lisa Lethin. Figure 4. Emily Hager(left) with her two sons and Helen Lethin(right), 1917. Courtesy of Lisa Lethin. Albert Hager also appeared to have come across the game. R. F. Foster (1924) reports an account by Hager that appears, from Foster’s wording, to be a direct communication from Hager about his experiences in China. It seems that Hager had also observed the game while serving as a volunteer policeman in China during the 1914-1919 world war. Figure 3. From the left; Anton Lethin, Helen Van-Housen Lethin, unknown, Norma Babcock and Joseph Babcock. The sailing vessel is the Meifooh, a Standard Oil owned Launch that sailed on the Yangtze River. (Courtesy of Lisa Lethin and Jelte Rep at; http://www.mahjongmuseum.nl/mijn-groot-vader-was-de-zakenpartner-van-joe-babcock/). Figure 4. Norma Babcock and Helen Van Housen-Lethin. (Courtesy of Lisa Lethin and Jelte Rep at; http://www.mahjongmuseum.nl/mijn-groot-vader-was-de-zakenpartner-van-joe-babcock/). By this time Joseph Babcock and perhaps Norma Babcock would have been well acquainted with the many local variations of mo ziang/má jiàng (Sparrows) from their extensive travels throughout China, and so the fundamental rules and game play would have been familiar to them. Further, from that perspective, the “unknown and strange game” was likely a strange and unknown variation or perhaps another tile game such as the domino game of wā huā (which also used the Flowers and Seasons tiles found in má jiàng). … My husband finally persuaded one of them to try it. … After several attempts he eventually succeeded in marking the first set of tiles with the properly placed foreign letters and numerals. From this series of accounts, it seems that the Hagers were introduced to the Chinese game in July 1919 when they had visited the Babcocks in Suzhou (via their friendship with the Lethins), but had decided the game was too difficult for foreigners. However, after Joseph Babcock had had a set made for the Lethin’s with the Arabic numerals and English letters included on the tiles, the Hagers may have witnessed the Lethin’s ease of play, undoubtedly during their socialising at the Columbian Country Club in the outer suburbs of Shanghai. According to Lisa Lethin (in private correspondence), the Lethins lived at the club probably from 1918-1920 and Anton Lethin was the Club Secretary. This would provide motivation for Albert Hager to make a further trip to Soochow [Suzhou] in late 1919, and it was then that Babcock had explained his idea of how to overcome the difficulties experienced by foreigners. It might have been at this point that Hager, Babcock and Lethin decided to buy as many tile sets as they could find in the Chinese shops and “left there to put Western numbers and letters [on the sets]”57 and to distribute them to their friends in Shanghai. Thus Albert Hager and his wife, together with Anton Lethin and his wife explained and taught the game to friends in Shanghai, again most likely at the Columbian Country Club where the Lethins were staying, and as a consequence discovered there was commercial potential from the game. As we shall see below, this rendition of the name of his game appears to be the version trademarked by Hager. “It was really here at Catalina that the idea of introducing mah jongg to America originated. It was at the Island Villa, the summer of 1920, that we, on top of the funny little Chinese traveling box, first set up a wall of Chinese bamboo tiles on good old American soil, and proceeded to have what we thought would be a quiet little game. But soon all the Island’s summer visitors were clustered about us, it seemed, and we were more an object of curiosity than a three-hundred pound tuna. A publicity correspondent made the most of a story about the new game in a Los Angeles newspaper and the thing was done. Before we reached San Francisco to re-sail for the Orient it seemed as though all of California and his wife had commissioned us to bring them a mah jongg set when we came again, or at least to send them one. They departed San Francisco on July 29, 1920 and arrived in Tsinan [Jinan] on August 19, 1920, where Joseph Babcock was on business on behalf of the Standard Oil Company61…. Babcock, Joseph P. ‘MAH-JONGG. Its Authentic Source’. In: The Saturday Evening Post, p. 127. Dec. 15, 1923. Babcock, Norma N. ‘MAH JONGG Started in Popularity at Catalina’. In: The Catalina Islander, p2 & p10. Apr. 16, 1924. Foster. R. F. ‘Foster on Mah Jong Mah Cheuk Ma Chang Pung Chow’. Dodd, Mead and Company. 1924. Source Information:Ancestry.com. U.S., Consular Registration Applications, 1916-1925 [database on-line]. Provo, UT, USA: Ancestry.com Operations, Inc., 2012. Original data: Department of State, Division of Passport Control Consular Registration Applications. 4.0 Setting the Foundation and Building the Companies. 4.1 Booklet, Book, Trademarks and Patents. Albert R. Hager, Salt Lake City, Utah. Filed Oct. 24, 1921. The Japanese characters appearing on the drawing mean, in English, “Sparrows”. Particular description of goods. 輸 Game played with pieces somewhat similar to dominoes. … Most of the sets are made from shin-bone — only the shinbones in the forelegs of cattle being used. Most of this material comes from the slaughter houses in Chicago. Some bone is obtained in China, but as they dont know the secret process for bleaching it properly, the native bone is used only in cheaper sets. From these extensive excerpts we know that “a year ago” would therefore approximate to early 1922 since Anton Lethin’s letter was dated February 18, 1923. Thus the “Mah-Jongg Company” of China was formed very early in 1922. But note the spelling for the name of the Company. Hager, as we shall see below, spelled it “Mah-Jong” whereas when referring to the game and the Company Lethin used the name “Mah-Jongg”. Babcock also used the latter term for the designation of the game as well as for the Company. “”Most of them are made in Shanghai” explained Mr. Babcock. The carving industry is a household art, so the sets as well as the boxes are made here and there. I don’t know, but thousands must be employed making them”. ALBERT R. HAGER, OF SHANGHAI, CHINA, ASSIGNOR TO THE MAH-JONG COMPANY OF CHINA, OF SAN FRANCISCO, CALIFORNIA, A COPARTNERSHIP CONSISTING OF JOSEPH PARK BABCOCK, ANTON N. LETHIN, AND ALBERT R. HAGER. Figure 6. Illustration from A. R. Hager’s Patent for a ‘Cabinet for Holding Games’. Figure 7. Vertical orientation showing patent number and date etc. Figure 8. Lateral orientation showing cabinet details. But note that in Hager’s patent application he does not mention Hammond. The 300,000 sets probably incorporated those sold by W. A. Hammond as well. But by the end of 1923 at least an extra 680 tons of sets had been imported into the United States. ALBERT R. HAGER, OF MANILA, PHILIPPINE ISLANDS. Figure 9. Illustration from A. R. Hager’s patent for a ‘Game-scoring Device’. This would place Hager returning to Shanghai February 21, 1923. This book was most likely the revised and enlarged, second edition hardcover version of Babcock’s booklet ‘Rules for MAH-JONGG The Red Book of Rules’. Titled 麻雀 Babcock’s Rules for MAH-JONGG The Fascinating Chinese Game’, it was printed in the United States and published February 1923. 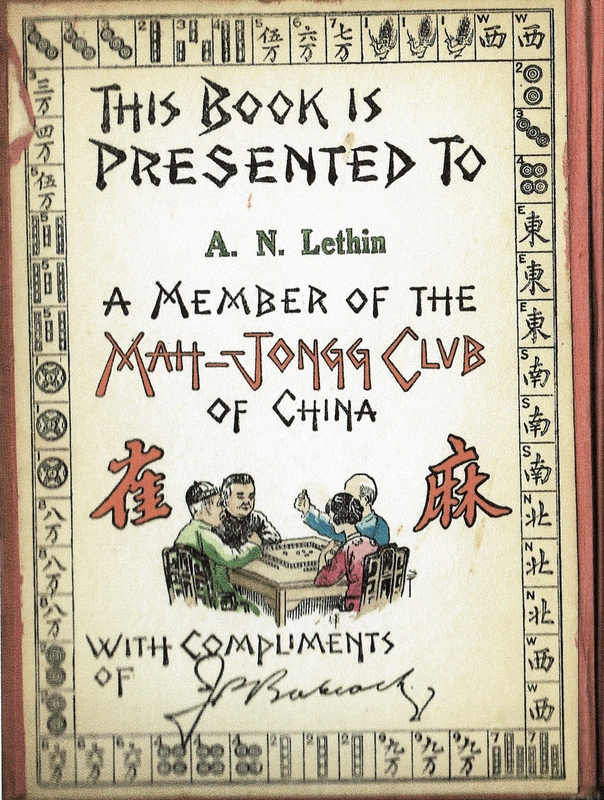 Anton Lethin had a copy of this edition of the rule book as a presentation copy for being a member of the MAH-JONGG CLUB of China. It appears to have been presented by his friend J. P. Babcock as Babcock’s signature attests at the bottom of a very fine presentation page pasted into the book (Figure 10). Figure 10. Presentation page inside a copy of Babcock’s hardcover ‘麻雀 Babcock’s Rules for MAH-JONGG The Fascinating Chinese Game’ (Courtesy of Lisa Lethin). The outcome of this intervention was no doubt the Patent Officers view that the patent lacked originality. By 1922 the Babcocks were still residing in Tsinan [Jinan]. The Mah-Jongg Sales Company of America, San Francisco, Calif. Filed Feb. 23, 1923. Particular description of goods.—Games played with pieces somewhat similar to dominoes. As was mentioned earlier, there is a discrepancy between Hager’s and Babcock’s logos for the game. Hager’s term is “Mah-Jongg” or “Mah-Jong”whereas Babcock’s is “MAH-JONGG” and both claim a “use since on or about October 26, 1920”. This is immediately following the September publication of the first edition of Babcock’s “Rules for Mah-Jongg”, which sports Hager’s trademarked logo. However, that logo was trade-marked by Albert R. Hager, not Babcock. It may have been at the behest of Joseph Babcock however, since they were both partners in the Mah Jongg Company of China. At the same time as these filing activities and under the guidance of Anton Lethin, the Mah-Jongg Company of China had been ordering and purchasing tile sets for export. As a consequence, about nine months later on September 19, 1923, the Babcocks had set sail aboard the S.S. President Lincoln laden with 170 tons of “bamboo and ivory” Mah-Jongg sets.76 They arrived at San Francisco on October 9, 1923 where Joseph Babcock gave his occupation as “marketer”. JOSEPH PARK BABCOCK, OF TSINAN, CHINA, ASSIGNOR TO MAH-JONGG COMPANY OF CHINA, OF SHANGHAI, A CORPORATION OF ALASKA. Continuation of application Serial No. 599,107, filed Nov. 4, 1922. This application filed December 19, 1923. Serial No. 681,584. Be it known that I, Joseph Park Babcock, a citizen of the United States, residing at Tsinan, China, whose post-office address is Friendship, New York, have invented an improvement in games, of which the following is a specification. This invention relates to a game and this application is a continuation of my co-pending application Serial No. 599,107 filed November 4, 1922. Figure 11. Vertical orientation of application drawing showing patent application number and dates. Figure 12. Lateral orientation showing tile groups. And so, following a two-year examination, the U.S. Patent Office granted Joseph Babcock a patent on September 22, 1925. Unfortunately, by 1925 the Mah-Jongg boom had collapsed. “US Patent Office, Official Gazette, Oct. 21, 1924. [Design] No. 65,794. SET OF DOMINOES. Figure 13. From the left; Joseph Babcock teaching Douglas Fairbanks the game of Mah-Jongg. (Courtesy of Christopher Babcock Berg). Following his patent and trademark filing activities, both he and Norma Babcock were booked for a return trip to China from Seattle on the S.S. President Grant, July 31, 1924. It is not clear whether they left for China however. By 1925 he was a student at Yale studying Law79. W. A. Hammond Co, hand-stamp on the back cover of Babcock’s 12 page ‘Rules for Mah-Jongg’. Culin to C. C. Henry, U.S. Patent Office, May 19, 1924, folder 068, Series 1.4, Culin Archival Collection. Brooklyn Museum, NY. (a) Footnote 25. “Mah Jongg King Arrives in City: Game originator Frightened, but Not Ashamed” Los Angeles Times, Oct. 25, 1223, section 2, p.10 in: Greenfield, Mary C. “The Game of One Hundred Intelligences: Mahjong, Materials, and the Marketing of the Asian Exotic in the 1920s.” Pacific Historical Review, Vol. 79, No. 3 (August 2010). pp. 329-359. (b) With reference to the ‘SS President Lincoln’; this ship should not be confused with its namesake that was sunk by a torpedo in May, 1918. See Footnote 32 for clarification. United States Census, June 1, 1925. Friendship, Allegany County, New York, United States. Joseph Babcock. ‘Student College’.